Fluorosis victims in Marriguda mandal of Nalgonda district. Nalgonda: A survey to identify fluoride victims in the district taken up two years ago has still not been completed, and even data collected so far reveals inaccurate figures. With an objective of collecting details of fluoride victims, district Collector Gaurav Uppal had decided in October 2016 to conduct a door-to-door survey in fluoride affected areas and deputed a Deputy District Medical and Health Officer rank officer to take up the task. The Collector set a six-month deadline for the survey report to be submitted, but the Health Department has not done it so far. Telangana Today had approached the officer who is in charge of the survey several times in the past five months, but the standard reply every time was that the survey would be completed within 10 days. Weather conditions and attending to other government programmes were cited as the reasons for the delay in completing the survey. In charge of the survey, Dr Kranthi said the staff had collected data from all fluoride-affected villages in the district. “The figures collected so far are not tallying with the ground reality. Hence, we want to recheck it,” he said. The data collected by the employees of health department during survey in Marriguda, which was in the hands of Telangana Today, was exposing the inaccuracy of the survey. As per the survey, there were 3,045 fluorosis victims including 2,312 dental fluorosis and 733 skeletal fluorosis patients in Marriguda mandal, which has a population of 36,454 people. Hence, nearly 10 per cent of people living in 36 habitations in Marriguda were suffering from Fluorosis disease. Interestingly, as per the survey, there were no skeletal fluorosis cases in the hamlets Sarampet thanda where fluoride content was 5.4 ppm, in Munnurguda, Somrajguda and Munnirguda the fluoride content was 5.2 ppm, Thurpu Thanda where the fluoride content was 4.5 ppm and Metichandapur, Rangan thanda, Devla thanda where the fluoride content was double than the permitted limit. Reacting to the figures, Kanchukuntla Subash of Fluoride Vimukthi Poratah Samiti said that the figures were indicating the inefficiency in collecting the data by the medical staff. He said that he personally know the skeletal fluorosis victims at the hamlets. Instead of ANMs and Asha Workers, the doctors and medical staff, who have knowledge of fluoride should be involved in the survey, he suggested. Dr Ram Babu, who worked in District Fluoride Monitoring Centre, said that they have planned to provide medical treatment to the fluoride victims with the help of corporate companies based on the survey details. “The district Collector has ordered for the door to door survey of fluoride victims in 2016 and directed the officials to submit the report by 2016 end. We had brought to his notice the exacerbated figures of fluoride in an earlier survey of victims as some of the orthopedically handicapped persons had registered their names as fluoride victims to get benefits from the government. Unfortunately, the survey reported was not completed even after expiry of tenure of DFMC”, he regretted. 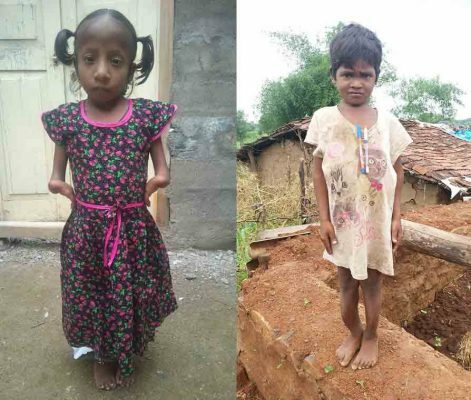 K Subash of Fluorosis Vimukthi Porata Samiti said ANMs and Asha Workers cannot identify the difference between orthopaedic handicapped and skeletal fluorosis victims, hence involving the expert doctors in the survey would help in getting accurate figures of fluoride victims. He was surprised to see the survey results showing no skeletal fluorosis cases were reported in the hamlets which had fluoride content recorded at 5.3 ppm. “I am working for the fluoride victims for the last 15 years. I personally know the skeletal fluorosis victims in the villages where the survey showed no such cases,” he added.